What I am working on: A public engagement process for the Animal Services code revisions. Last month I traveled to Texas, for the International Association for Public Participation’s Skills Symposium where I completed the Dealing with Opposition and Outrage in Public Participation training. There were a number of things that I got out of the class, but the one that sticks out to me is the power of an apology. From a young age we are taught to apologize when we do something wrong, but what happens when an organization does something wrong. How does the apology work, who delivers the apology, and what do organizations do to make it right. While we have seen a number of corporate apologies, but it isn’t often we see government agencies apologize, especially for things that happened under prior administrations or elected officials. Residents hold onto our wrongs, both real and perceived, done by staff or elected for a long time and we have to work hard to overcome those challenges to rebuild trust. Even when it wasn’t us personally an apology can go a long ways to rebuilding the trust we have with residents. Be sincere. This isn’t a time for jokes or a sorry, not sorry attitude. Whoever gives the apology should be able to show their sincerity. Show them you heard their perspective. Nothing is more frustrating than feeling like you aren’t being heard. By actively listening to their perspectives, not matter how long it takes, you can ensure that they are feeling heard. Every resident can have a slightly different story and perspective, so making an effort to hear as many as possible helps to show your sincerity as well. Follow through with making it right. 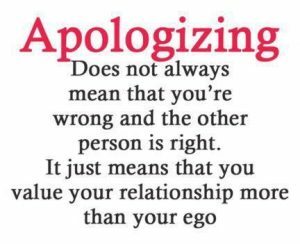 The period of time after an apology is key, because it is when trust is built. Be upfront, and follow up with what you promised. Keeping the lines of communication open, and flowing. Focus on building those relationships to keep momentum going. As the class talked about the power of an apology all I could think about was the Flint water crisis. The residents grew more and more frustrated as their officials told them their water was fine despite the water’s appearance and other signs it wasn’t safe. I wondered how an apology would have played out and if had been done well would have brought people together creating a turning point that shifted the focus toward solutions and working together. An apology can’t change what happened to them, but it can change everyone moves forward. In the class we talked about how apologies can act as admissions of guilt which can make attorneys nervous. While this is true we are all human and we make mistakes, and apologizing, making things right is a part of our humanity. Whether we made a mistake or it was someone before us, we can start making things better with an apology, and when we can make things better we should.